You may receive updates from NYRenews Coalition, the sponsor of this petition. Tell New York State to Support NYRenews! The impacts of climate change are hitting low-income communities and communities of color first and worst. Rachel Rivera is a mother, a Brooklyn resident, a member of NY Communities for Change, and a Superstorm Sandy survivor. After the storm destroyed Rachel’s roof, she was forced to move her family into a shelter. Struggling to pay for the damage and keep her family safe, Rachel’s family spent three years in the shelter system. Her daughter still cries when it rains. Tell NY State to support NYRenews for good jobs and frontline justice, with 100% clean and renewable energy. We know that the in order to create solutions that work for absolutely everyone we must tackle climate change while investing in Environmental Justice communities and good jobs. This change will be good for our jobs, good for our economy, good for our health and good for our kids. In New York, both upstate and downstate, we've experienced firsthand the repercussions of inequality and climate change, and we have the solutions. NY state leaders have paid lip service to investing in our communities and fighting climate change. Now is the time to demand action. 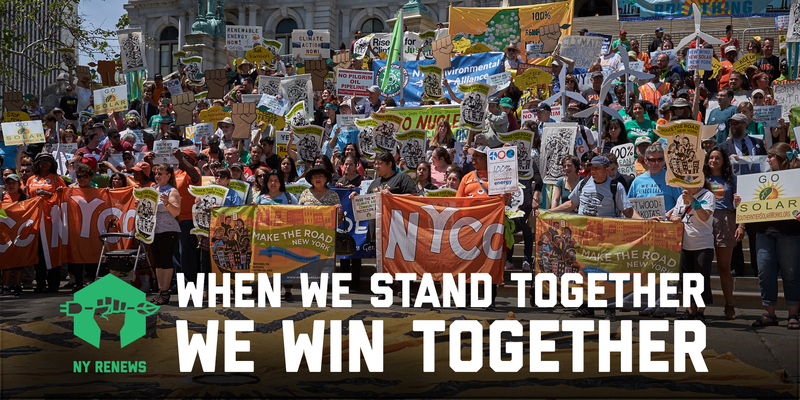 That's why an unprecedented coalition of New Yorkers from Labor Unions, to Environmental Justice groups under the NYRenews - to hold politicians accountable for investing in our communities, our environment, and our economy. When we stand together, we win together. NYRenews is demanding what New Yorkers need most: good paying jobs, healthier communities, and environmental justice, all through 100% clean and renewable energy for all of New York State by 2050. Support the NYRenews platform by combating climate change, protecting front-line communities, strengthening workers’ rights, ensuring good paying jobs and requiring 100% clean renewable energy by 2050.